He received a B.S. degree in physics at Duke University, 1959–1963. After this, he moved to Louisiana State University (LSU) to study postgraduate physics. In 1969, while doing his dissertation research for LSU in the mountains of Colorado, he committed his life to Christ. In 1972, he was awarded a Ph.D. in physics, on cosmic rays and ultrahigh energy nucleon–nucleon interactions, by which time he was a fully convinced creationist due to both the biblical and scientific evidence. For the next 6 years he worked in the High Voltage Laboratory of General Electric Company, designing and inventing equipment and researching high–voltage phenomena. While there, he received a U.S. patent and one of Industrial Research Magazine’s IR–100 awards. Beginning in 1979 he worked for Sandia National Laboratories (New Mexico) in nuclear physics, geophysics, pulsed-power research, and theoretical atomic and nuclear physics. In 1985, he began working with Sandia’s ‘Particle Beam Fusion Project’, and was co-inventor of special laser-triggered ‘Rimfire’ high-voltage switches, now coming into wider use. The last decade at Sandia saw greater emphasis on theoretical nuclear physics and radiation hydrodynamics in an effort to help produce the world’s first lab–scale thermonuclear fusion. Besides gaining two other U.S. patents, Dr Humphreys has been given two awards from Sandia, including an Award for Excellence for contributions to light ion–fusion target theory. Designed and theoretically analyzed thermonuclear fusion targets using radiation hydrodynamic codes. Designed key high-voltage parts of Sandia’s 100-Terawatt Particle Beam Fusion Accelerator II and conducted fusion power experiments on it. Same designs are in use today on Sandia’s Z machine. Research on low-temperature solids and studies on superconductors. Nuclear weapons projects, including stockpile engineering for W87 firing set. Helped design new inkjet printer component and shared patent on it. Developed high repetition-rate neutron tube driver and gamma-ray spectrometer for borehole logging applications. Patent on high-voltage power supply for it. Patents on wide-bandwidth electric field sensor and high-voltage neutron tube supply. Designed lightning current waveform recorder which won IR-100 Award. Studied electric fields and ion currents under ultrahigh voltage DC transmission lines. Theoretical studies of relativistic velocity dependence of nuclear forces. Dr Humphreys retired from Sandia in 2001 to work full-time for the Institute for Creation Research (ICR) where he was appointed an Associate Professor of Physics. In this time, he operated mainly from his home office in Albuquerque, NM, USA, while still continuing to write for Journal of Creation (formerly TJ) and assisting several other creationist organisations with questions and information concerning physics, astronomy and cosmology. In August 2008 he resigned from ICR and now works as an independent researcher. 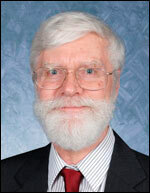 Dr Humphreys has been a longtime member of the Creation Research Society and is on its Board of Directors. New view of gravity explains cosmic microwave background radiation, Journal of Creation 28(3):106–114, December 2014. More secular confusion about the moon’s former magnetic field Journal of Creation 27(2):12–13, August 2013. Argon from RATE site confirms the earth is young Creation 34(3):40–42, July 2012. Argon diffusion data support RATE’s 6,000-year helium age of the earth, Journal of Creation 25(2):74–77, 2011. Earth's rapid magnetic field reversals. Why has one author retracted? Evidence for a Young World, Creation 13(3):28–31, 1992. Explaining the Pioneer effect? Russell Humphreys replies, Journal of Creation (Journal of Creation) 22(1):55–56, April 2008. Pioneer anomaly: still unsolved? Russell Humphreys replies, Journal of Creation, 21(3):67–68, December 2007. D. Russell Humphreys replies and clarifies cosmology, Journal of Creation 16(3):76–78, 2002. Our galaxy is the centre of the universe, ‘quantized’ red shifts show, Journal of Creation 16(2):95–104, 2002. Russell Humphreys replies, (Reply to Worracker) Journal of Creation 15(2):47–48, 2001. Errors in Humphreys’ cosmological model: Humphreys replies, Journal of Creation 14(2):81, 2000. Among letters Archived at . Starlight and time: a response, (Reply to Connor and Page) Journal of Creation 14(2):73–76, 2000. ‘Starlight and Time’ (Reply to Hunter), Journal of Creation 13(1):61–62, 1999. Humphreys’ new vistas (Replies to Ross, Duff, and Conner), Journal of Creation 13(1):50–60, 1999. Among letters archived at . New vistas of spacetime rebut the critics, Journal of Creation 12(2):195–212, 1998. Archived at . Timothy tests theistic evolutionism, Journal of Creation 11(2):199–201, 1997. Archived at . C decay and galactic redshifts, Journal of Creation 6(1):74–79, 1992. Anti-creationists: do they fear an overthrow of Darwin in the U.S.? Recently measured helium diffusion rate for zircon suggests inconsistency with U-Pb age for Awards Fenton Hill granodiorite (lead author is Humphreys), Eos, Transactions of the American and Geophysical Union 84(46), Fall Meet. Suppl., Abstract V32C-1047 (December 2003). Poster at . The enigma of the ubiquity of 14C in organic samples older than 100 ka (lead author is J. R. Baumgardner), Eos, Transactions of the American Geophysical Union 84(46), Fall Meet. Suppl., Abstract V32C-1045 (December 2003). Poster at . U.S. Patent No. 6,350,015 (26 Feb 2002) Magnetic drive systems and methods for a micromachined fluid ejector. Comparison of experimental results and calculated detector responses for PBFA II thermal source experiments, Review of Scientific Instruments 63(10), October 1992. Sandia National Laboratories Award for Excellence in developing and executing new and innovative light ion target theory, 1990. Inertial confinement fusion with light ion beams, 13th Internat. Conf. on Plasma Physics and Controlled Nuclear Fusion Research, Washington, D.C. 1–6, October 1990. Reducing aspect ratios in inertial confinement fusion targets, JOWOG 37 Conference, Albuquerque, NM, January 1990. (Contents classified). Progress toward a superconducting opening switch, Proceedings of the Sixth IEEE Pulsed Power Conference, Arlington, Virginia, 1987, pp. 279–282. Scaling relations for the Rimfire multi-stage gas switch, Proceedings of the Sixth IEEE Pulsed Power Conference, Arlington, VA, 29 June – 1 August 1987. Rimfire: a six megavolt laser-triggered gas-filled switch for PBFA-II, Proceedings of the Fifth IEEE Pulsed Power Conference, Arlington, Virginia, 10–12 June 1985, pp. 262–269. PBFA II, a 100 TW pulsed power driver for the inertial confinement fusion program, Proceedings of the Fifth IEEE Pulsed Power Conference, Arlington, Virginia, 10–12 June 1985. Uranium logging with prompt fission neutrons, International Journal of Applied Radiation and Isotopes, 34:261–268, 1983. Scientific creationism, Physics Today 35:84–86, June 1982. Uranium logging with prompt fission neutrons, IEEE Transactions on Nuclear Science, NS–28 (1981) 1691–1695. Pulsed neutron gamma ray logging for minerals associated with uranium, 6th Conf. on Small Accelerators in Research and Industry, Denton, TX, November 3–5, 1980. Sandia National Laboratories document no. SAND80-1531. Wide-range multi-channel analog switch, Nuclear Instruments and Methods 121:505–508, 1974. The 1/γ velocity dependence of nucleon-nucleus optical potentials, Nuclear Physics A182 (1972) 580. Studies of hadron interactions at energies around 10 TeV using an ionization spectrometer–emulsion chamber combination, Proc. 11th Int. Conf. on Cosmic Rays, Budapest 1969, in Acta Physica Acad. Sci. Hungaricae 29 (1970) 497–503. Wide-range multi-input pulse height recording system, Review of Scientific Instruments 38 (1967) 1123–1127. The Creation of Cosmic Magnetic Fields, Proc. Sixth International Conference on Creationism (ICC), 3–7 August 2008, Pittsburgh, Pennsylvania, pp. 213–230. Proceedings, PowerPoints, and DVDs available from . Creation cosmologies solve spacecraft mystery, Acts & Facts 16(10):10–12, October 2007. HTML version archived at . A tale of two hourglasses, ICR Impact No. 402, December 2006. Archived at . Helium pressures Henke, True Origins Internet article, 5 January 2006. Archived at . Young helium diffusion age supports accelerated nuclear decay, in Radioisotopes and the Age of the Earth, Vol II: Results, Vardiman, Snelling, and Chaffin, editors, Institute for Creation Research/Creation Research Society, El Cajon, CA, chapter 7, pp.25–100, 2005. Evidence for a young world, ICR Impact No. 384, June 2005. Archived at . What the ASA doesn’t want its readers to know, Creation Matters 13(2):1–2, March/April 2008. Helium evidence for a young world remains crystal-clear, True Origins Internet article, 27 April 2005. Archived at . Isochrons made easier, Creation Matters 9(6):1–2, November/December 2004. Archived at . 14C — The creationists’ friend, Creation Matters 9(6):5,2, November/December 2004. At . Mercury’s messenger, Creation Matters 9(4):1,9, July/August 2004. Archived at . Helium diffusion age of 6,000 years supports accelerated nuclear decay (lead author is Humphreys), Creation Research Society Quarterly (CRSQ) 41(1):1–16, June 2004. Archived at CRSQ/articles/41/41_1/Helium.htm>. New RATE data support a young world, ICR Impact No. 366, December 2003. Archived at . Helium diffusion rates support accelerated nuclear decay (lead author is Humphreys), Proc. Fifth ICC, 4–9 August 2003, Geneva College, Beaver Falls Pennsylvania, pp. 175–208. Archived at . Radioisotopes and the age of the earth, (lead author is L. Vardiman), Proc. Fifth ICC, 4–9 August 2003, Geneva College, Beaver Falls Pennsylvania, pp. 337–348. Archived at . Measurable 14C in fossilized organic materials: confirming the young earth creation-flood model, (lead author is J. R. Baumgardner), Proc. Fifth ICC, 4–9 August 2003, Geneva College, Beaver Falls Pennsylvania, pp. 127–142. Archived at . Gray clouds in the heavens, CRSQ 39(4):278, March 2003. Carbon 14 is the creationist’s friend, Creation Science Fellowship Newsletter 14(1), Insert, pp. 1–4, (January 2003), CSF of New Mexico, P.O. Box 6212, Albuquerque, NM 87107. Nuclear decay: evidence for a young world, ICR Impact No. 352, October 2002. Archived at . Gray clouds, CRSQ 39(2):137, September 2002. The battle for a cosmic center, ICR Impact No. 350, August 2002. Archived at . The Earth’s magnetic field is still losing energy, CRSQ 39(1):3–13, June 2002. Archived at CRSQ/articles/39/39_1/GeoMag.htm>. Seven years of Starlight and Time, ICR Impact No. 338, August 2001. Archived at . Accelerated nuclear decay: a viable hypothesis? in Radioisotopes and the Age of the Earth, Vol. I, Vardiman, Snelling, and Chaffin, editors, Institute for Creation Research/Creation Research Society, El Cajon, CA, chapter 7, pp. 333–379 (2000). Book Archived at (free 2.8 MB PDF file). Evidence for a young world, Creation Matters 4(4):1–4, July/August 1999. Archived at . Mars Global Surveyor confirms creation, Creation Matters 4(3):8, May/June 1999. Archived at . Catastrophic flood on Mars? Creation Matters 2(5), September/October 1997. Archived at . Creation wins some more in New Mexico, Creation Matters 2(3), May/June 1997. At . It’s just a matter of time, CRSQ 34:32–34, March 1997. Can evolutionists now explain the earth’s magnetic field?’ CRSQ 33:184–185, Dec. 1996. Was Mars ‘infected’ by life from Earth? Creation Matters 1(5), September/October 1997. Archived at . How we can see a young universe: a reply to Conner and Page, Bible-Science News 33(7):12–19, September 1995. There you go again, Dr. Ross! Bible-Science News 33(6):6–7, August 1995. No good reasons to oppose relativity, Bible-Science News 33(5):9, July 1995. Seeing distant stars in a young universe: a new creationist cosmology, Bible-Science News 33(4):14–17, May 1995. An open letter to Hugh Ross, Bible-Science News 33(4):21–22, May 1995. God created relativity, Bible-Science News 33(3):10–11, April 1995. Starlight and Time, Master Books, Green Forest, Arkansas, 1994. Towards a young-earth relativistic cosmology, Proc. Third ICC, 29 July – 4 August, 1994, Pittsburgh, Pennsylvania, pp. 267–286. A Biblical basis for creationist cosmology, Proc. Third ICC, 29 July – 4 August 1994, Pittsburgh, Pennsylvania, pp. 255–266. The Earth’s Magnetic Field is Young, ICR Impact No. 242, August 1993. Archived at . Bumps in the Big Bang, ICR Impact No. 233, November 1992. Archived at . Physical mechanism for reversals of the Earth’s magnetic field during the Flood, Proc. Second ICC, 29 July – 4 August 1990, Pittsburgh, Pennsylvania, Vol. II, pp. 129–142. The sea’s missing salt: a dilemma for evolutionists, (co-authored with Steven A. Austin), Proc. Second ICC, 29 July – 4 August 1990, Pittsburgh, Pennsylvania, Vol. II, pp. 17–33. 2nd Prize, Best Technical Paper award, 1990 ICC. (Shared with Steven A. Austin). Good news from Neptune: The Voyager 2 magnetic measurements, CRSQ 26:15–17, June 1990. New evidence for rapid reversals of the Earth’s magnetic field, CRSQ 26:132–133, March 1990. Beyond Neptune: Voyager II supports creation, ICR Impact 203, May 1990. Archived at . Reply to Bowden, CRSQ 26:33, June 1989. Inadequate defense of c-decay hypothesis, CRSQ 26:30–32, June 1989. The mystery of the earth’s magnetic field, ICR Impact No. 188, Feb. 1989. Archived at . Has the Earth’s magnetic field ever flipped?" CRSQ 25:130–137, Dec. 1988. Has the speed of light decayed recently?" CRSQ 25:40–45, June 1988. Creation’s tiny mystery (book review), Ministry 60:28–29, July 1987. The magnetic field of Uranus, CRSQ 23:115, Dec. 1986. Reversals of the Earth’s magnetic field during the Genesis flood, Proc. First ICC, 4–9 August 1986, Pittsburgh, Pennsylvania, Vol. II, pp.113–126. Best Technical Paper award, 1986 ICC. (Shared with Steven A. Austin and John D. Morris). ¿Son contemporaneos los hombres y los dinosaurios?, el Centinela, Año 89(2)11–13, Feb. 1985. Pacific Press Publishing Association, 1350 North Kings Road, Nampa, ID 83563. The creation of planetary magnetic fields, CRSQ 21:140–149, Dec. 1984. Archived at CRSQ/articles/21/21_3/21_3.html>. The creation of the Earth’s magnetic field, CRSQ 20:89–94, Sept. 1983. Dinosaurs lived with men, Moody Monthly 83:44–46, May 1983. Is the Earth’s core water? Part one: the Biblical evidence, CRSQ 15:141–147, Dec. 1978. Using the Second Law more effectively, CRSQ 14:209–210, March 1978.